In some respects, all adventurers are mercenaries, but if you want to sell your sword (or other prowess - I had a character once who hired out as a cook! ), this is an essentual resource. Publisher's blurb: "The ultimate man-for-hire guide, Mercenaries is full of the best d20 has to offer: New classes, races, equipment, spells, monsters, mounts, and rules for creating mercenary companies. 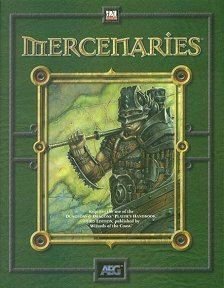 The perfect companion to the Player's Handbook, Mercenaries belongs at every table. Even contains a complete collection of tables and charts from official 3rd Edition and AEG's d20-books including spells, equipment and domains."